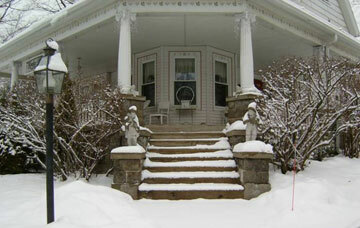 Welcome to The Kingsley House Bed and Breakfast in the Heart of Southwest Michigan. 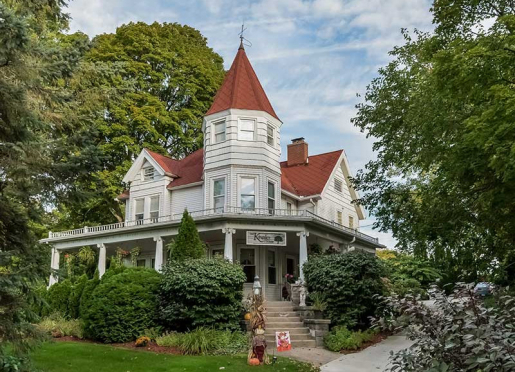 Enchanting Historic Queen Anne Victorian in the heart of Southwest Michigan amid Fruit Orchards, Wineries and breathtaking countryside. Located in the center of it all, with so much to see and do year-round in nearby Saugatuck, Holland and South Haven. 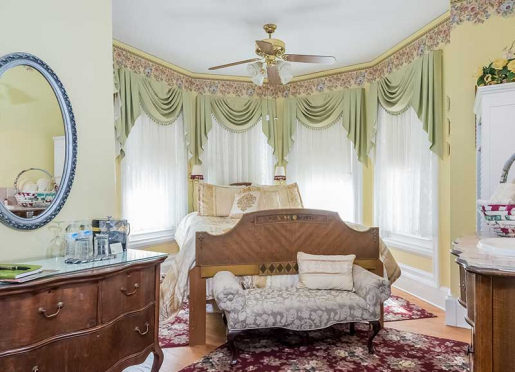 "Voted Top 12 Inn Worldwide, Best Breakfast in the U.S. and Best Innkeeper in the U.S."
Stunning and Spacious Jacuzzi/Fireplace suites and lush chambers all with private baths, cable TV, VCR/DVD. 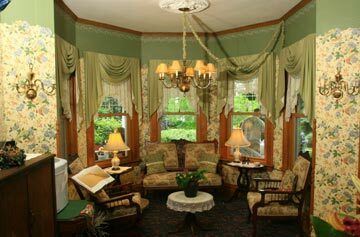 Large wrap-around porch, four story turret and eight fireplaces (seven within suites and chambers), add to the elegance of the Inn. We offer an extensive list of spa and concierge services, including in-house massages, manicures and pedicures as well as dinners, picnic baskets, wine baskets, flowers, cakes and more. Pampered amenities include seasonal treats, aromatherapy toiletries, complimentary beverages, in-house video collection. 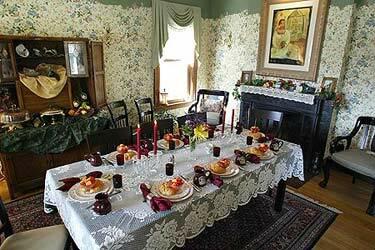 Elegant and peaceful, the Kingsley House offers guests a romantic setting with real hometown hospitality. 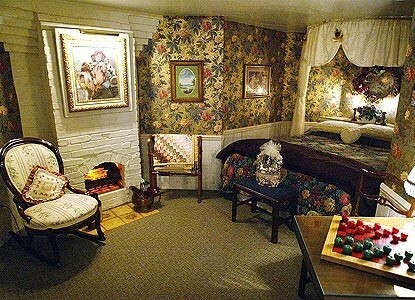 The Inn features eight guest quarters, all with private baths, cable TV, fireplaces and more. Four of the rooms are whirlpool suites with spa amenities. Breakfast is served buffet style and has won numerous awards. 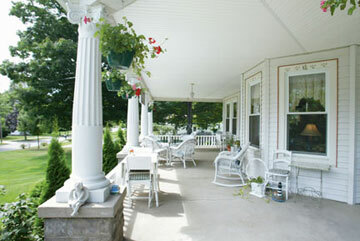 Featured as one of the top 12 Inns worldwide in the 2008-2009 Bedandbreakfast.com awards, the Kingsley House has also garnished national recognition from The New York Times, Forbes and Time magazine. best weekends of our marriage and we thank you so much for all the romantic touches." From late spring to early fall, guests dine on the expansive wrap-around porch. 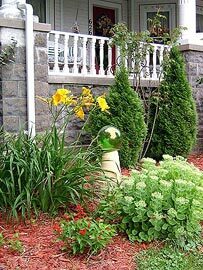 The grounds are quite large with numerous perennial flowers and trees, swings, lawn games and a large parking lot with ample room for all of their guests to park. 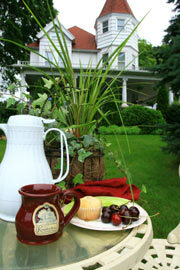 Afternoon treats of lemonade and brownies are guest favorites as they lounge on the popular wicker porch swing. In the fall, there are caramel apples and cider awaiting and S'Mores and hot cocoa in the wintertime. Other guest amenities include wireless internet throughout, complimentary hot and cold beverages available 24-hours a day and a large video/DVD library for guests to enjoy in the privacy of their own luxurious suite. 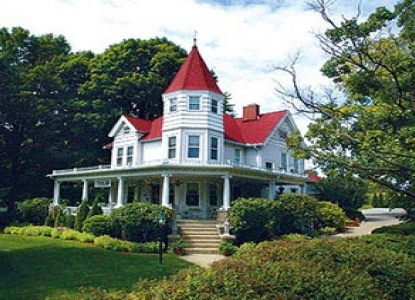 The Inn is open year-round and offers a wide array of packages and services, including wine lover's weekends, murder mysteries, cooking classes, limousine wine tour packages and women's getaway weekends. Spa services including in-house massages, facials and manicures are also available as well as personal touches like picnic baskets for guests to enjoy, gourmet chocolate trays, spa baskets, long-stem red roses and more. 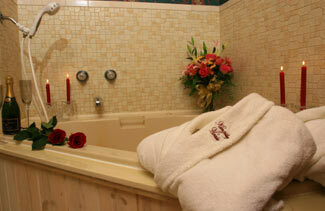 The primary focus of the Kingsley House is Romantic Getaways and they offer many romance/spa packages. The Inn hosts small weddings, anniversaries, honeymoon packages and even a hot air balloon ride package that has become quite popular for engagements, anniversaries or "just because" celebrations. 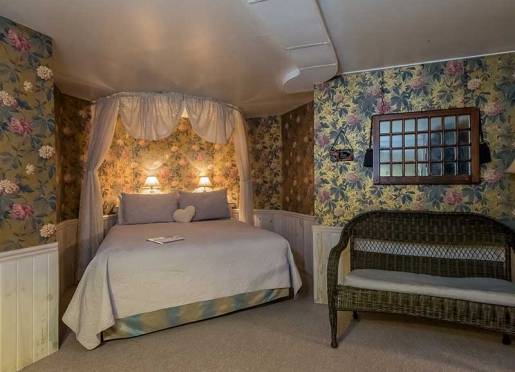 Whether looking for a quick relaxing trip, a theme package weekend or a romantic getaway with someone special, the Kingsley House is sure to please. 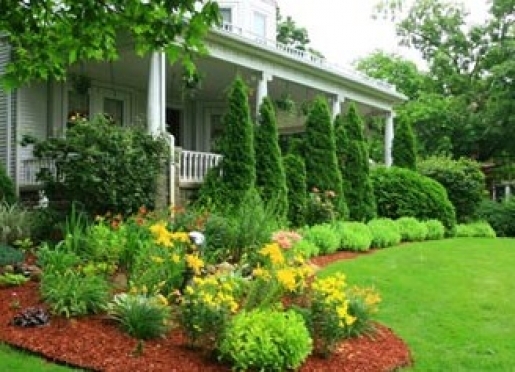 Experience why we received the distinctions of "Top 12 Inn Worldwide" by Bedandbreakfast .com, "Best Breakfast in the U.S.," "Best Breakfast in the Midwest" "Best Innkeeper in the U.S." and "Best in the Midwest by Arrington's Inntraveler." Your host, Dave Drees, hopes to have the opportunity to show you why the Kingsley House hospitality is top-notch! Travelers are always looking for memorable and relaxing experiences. Let’s discover more through the words of our innkeepers. Many thanks to Dave Drees for sharing his own secrets with BBOnline.com! 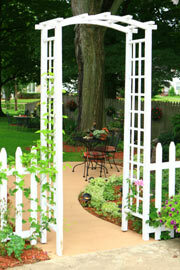 Romantic peaceful getaways yet convenient to so many close by options of towns, lake, wineries, etc. 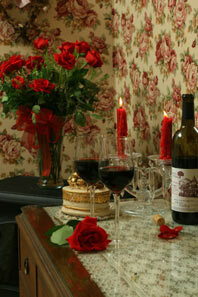 Just by the nature of the Inn's character, it is a romantic Inn. It was built in 1886 by a farmer (Kingsley) who researched apple cross-pollination and production. 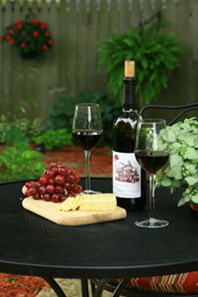 Country charm In Michigan wineries/apple orchards country yet still close to so many options of things to do. Actually heard quite often too: Even though there are nine bedrooms, you feel like you are in the Inn by yourself because it is so peaceful. We're not a very far distance from major Michigan cities either....45 minutes to Grand Rapids, 45 minutes to Kalamazoo. 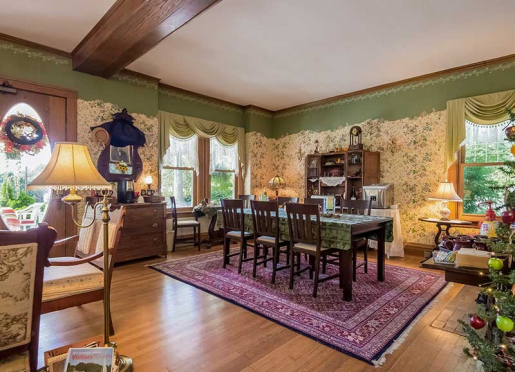 Multiple options in any direction: 5 minutes west is Lake Michigan, 5 minutes west is Allegan Forest, also 5 minutes from Fenn Valley Winery and Cranes Apple Orchards, 10 minutes from Saugatuck, 20 minutes from South Haven, 20 minutes from Holland. Yes, downtown Fennville has restaurants (Salt of the Earth highly acclaimed) as well as stores, small town shopping, parks, etc. Cranes for lunch/desert, Salt of the Earth for gourmet food dining. We have 9 - 4 suites, 2 jr suites, 3 standard. No we do not; there are some local pet housing alternatives in the area. Please ask on request. 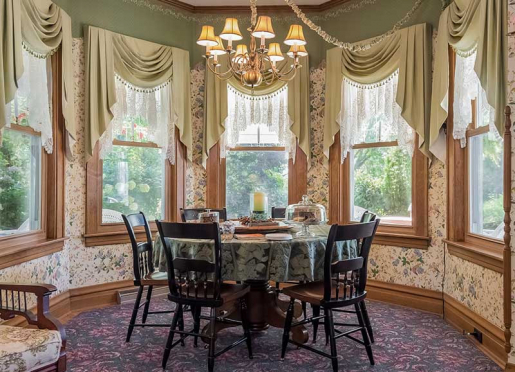 Having grown in the Northwest,your host Chuck & Sally share their appreciation of fine Victorian details, open countryside living and gracious "hometown" hospitality with the many guests of the Kingsley House and Southwest Michigan. Guests are usually surprised when they learn Chuck had spent 30 years in the corporate and business world with his own busness as an Exective placement consultant. This experience has served him well in establishing a sound business plan for the Kingsley House. But it is his passion for hospitality, cooking, gardening, decorating and nature that drew him to Innkeeping. The Arrington's Inn Traveler awards of "Best Innkeeper in the U.S.," "Best in the Midwest" and "Best Breakfast in the Midwest" are a testimony to his passion and love of the hospitality he shows his guests. 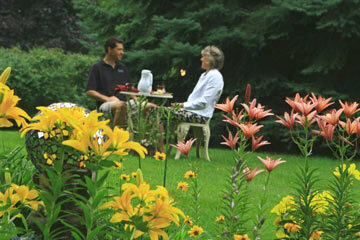 In& their spare time, Chuck and Sally enjoy golfing, gardening, cooking and enjoying Lake Michigan sunsets. The perfect setting for a relaxing retreat. 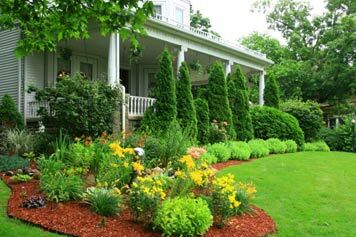 We are one of the most recognized Southwest Michigan Bed and Breakfast Inns for a reason--the attention we pay to our guest's needs. We're sure you will agree that we have thought of everything to make your getaway enjoyable and memorable. WIFI Wireless Internet Access is available free-of-charge throughout the Inn for our guest's use during their stay with us. 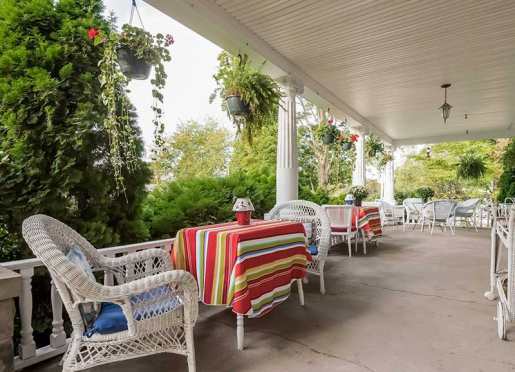 After a full day of exploring Saugatuck, Holland or South Haven, have a seasonal treat of lemonade and cookies on our large wrap around porch in the summertime. Or indulge in caramel apples and hot cider before touring Cran'es corn maze in the fall and make your own s'mores and hot cocoa in the wintertime after skiing or ice skating. The wicker furniture on our front porch is a popular place all day long, especially the porch swing overlooking the front lawn and the large seating area to relax to a good book or an afternoon wine and cheese break for two. Relax in the backyard canopy swing while taking in the countryside surroundings or cuddle up together in our side garden's hammock while listening to the numerous species of birds. Don't forget to come back from dinner in time to watch a movie in the privacy of your own luxurious suite or room. All guest accommodations include cable TV with VCR/DVD player and we have an extensive free current and classics video library for your convenience. We also have a large collection of board games for a romantic night for two or a fun time with friends. A hot beverage machine is available 24 hours for your enjoyment of select coffees, teas, cocoa and cider as well as complimentary sodas and bottled waters. Boating. White Sand Beaches. Swimming. Fishing. Hiking: Trails available in Allegan State Forest and Saugatuck Dunes State Park. Bicycling: Many trails. Some along the lake. Summer Theatre: The Mason Street Playhouse. Gourmet Dining: Sidewalk cafés to French Country Cuisine. Antiquing: Allegan Antique Market and many shops and malls. Golf: Several coarses to choose from. Winery: Fenn Valley Vineyards. Open all year. Cross Country: Beginner to Advanced. Equipment rentals available. Down Hill: Two areas within 25 miles. Ice Skating: On nearby Hutchins Lake. Shopping: Art Galleries. Crafts. Home Decor. Antiques. Clothing. Something for everyone. Gourmet Dining: Special restaurants for that special occasion. Christmas: Plays. Concerts. Home Tours. Breakfast is always an event at the Inn, no matter what day of the week. A typical breakfast starts with peaches in a cloud, fresh seasonal fruits, our famous blueberry coffee cake, lemon poppy seed muffins and more. The main course includes numerous guest favorites such as Apple-cherry crisp French toast, Egg strata souffle', Belgian waffles, Fluffy omelets, Sweet-tangy kielbasa sausage, Cheesy basil potatoes and more. Dietary restrictions are no problem as we go out of our way to accommodate our guest's needs. All our breakfasts are home made with farm fresh ingredients and we use local Michigan farmer's market harvests whenever possible. Breakfast is included in our room rates. Quoting from a recent bride, "our wedding at the Kingsley House was a fairy tale come true." 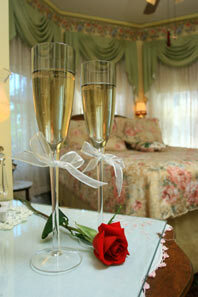 "Romantic Getaways" page for details and to plan your Fairytale Wedding.